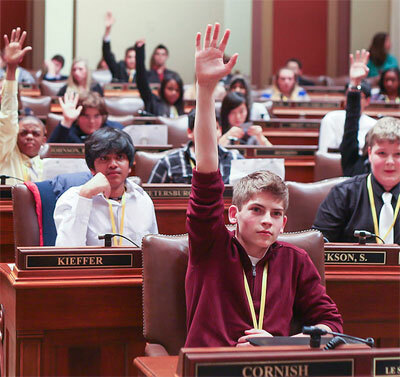 The YMCA Youth in Government program, a statewide youth civic education and leadership development initiative, encourages over 2,400 students in grades 7-12 from Minnesota and western Wisconsin to be life-long, active citizens through hands-on learning experiences. Since 1946, the Y’s Youth in Government has provided students with the opportunity to develop leadership, build citizenship skills and experience democracy. This program prepares students for responsible leadership in the democratic process by providing guidance, training and experience in the theory and practice of determining public policy. Lindquist added that some participants ¬— such as recently elected Minnesota Secretary of State Steve Simon and former Congressman-turned-Minnesota Court of Appeals Judge David Minge — have gone on to public office, while others have become advocates for domestic violence prevention or attorneys working for the U.S. Department of Justice, teachers and parents. Model Assembly Session – Approximately 1,500 students in grades 8-12 gather annually at the State Capitol to replicate the functions of state government. This year’s recent 61st Model Assembly, the state’s largest hands-on civics education event, offered students an opportunity to gain experience with the process of making or changing laws, trying court cases and creating open government – without bitter partisanship. Model United Nations – More than 600 students in grades 7-12 adopt a country and represent that nations’ government at a session which models the activities of the United Nations. Youth Conference on National Affairs (CONA) – The YMCA Youth Conference on National Affairs gathers more than 600 students from more than 30 states’ Youth in Government programs to discuss ideas that will change and improve the nation and the world. Retreats and Training Events – Through retreats and workshops students build their skills, explore the concept of servant leadership, and prepare for leadership responsibilities at state conferences and local delegations. Listen to James’ Story and discover how the YMCA Youth in Government program has helped him learn about government as well as gain values, self-esteem and a drive to give back to his community. As a leading nonprofit committed to youth development, financial assistance is available to those in need to ensure youth can thrive. Learn more about the YMCA Youth in Government program.